Helped a friend fix an issue with Chrome. Chrome was fine one and not the next. Chrome would open but wouldn’t finish loading a page. I fixed a Chrome issue before so I tried the following. Here were the steps I took. Neither one of these fixes worked. Here are the steps I took that got Chrome working again. Uninstalled Java ( version 6, current version 8). Ran CCleaner to fix Registry. Ran CCleaner to fix Registry again. Re-installed Chrome and everything worked again. Another user in Google Forums posted this solution. 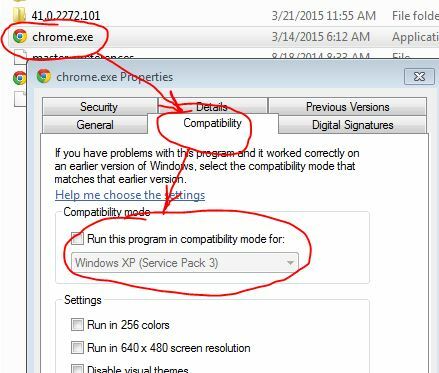 C:\Program Files (x86)\Google\Chrome\Application into your windows “Search programs and files” box (Windows picture in bottom left of your screen). Right click on the Chrome icon and in the settings I had to check a box that made it compatible with the version of Windows I was using. It worked immediately. We had a client who’s Quickbooks suddenly stopped working properly. When the program would start to open there was an error thrown. This was solved by repairing the program. I went into add/remove programs. 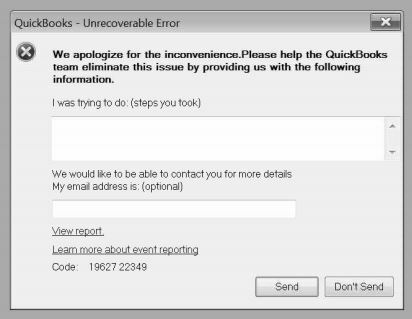 Selected Quickbooks and clicked uninstall. Through this process I was given the choice to repair. When the repair process was finished the program ran normally. Save failed with the following error: A first level menu item alias cannot be ‘media’ because ‘media’ is a sub-folder of your joomla installation folder. Googling this error brought to the following page. Basicly you can name the link “Media” just make sure to specify the alias to be something else. Recently had to work on machine that had a new profile and in the device manager the video, audio, and a few other drivers weren’t working for this new profile. I was working remotely and didn’t know what hardware was actually in the machine, so I wasn’t sure which drivers to install. Another tech advised install “Slimdrivers”. I Googled “slimdrivers”, downloaded the executable to the remote machine. Installed the program and ran it. It came back and had the all the drivers needed for that machine. I installed the video and audio drivers slimdrivers recommended and the problem was solved. I would recommend this software to anyone with a driver issue. Fetch as Google tool to index your sites webpages again. Resubmitting your website to Google to crawl and index your site. You must first have your site in Webmaster tools. Then in webmaster tools select your site. On the left is menu to “Crawl”. Then select “Fetch as Google”. After you Fetch your site click submit to index. Here is the link I started with.